Tomato, tomahto = sorbet, sherbet? Not quite. Tomato and tomahto are the exact same creature, whereas the other pair refers to different concoctions. 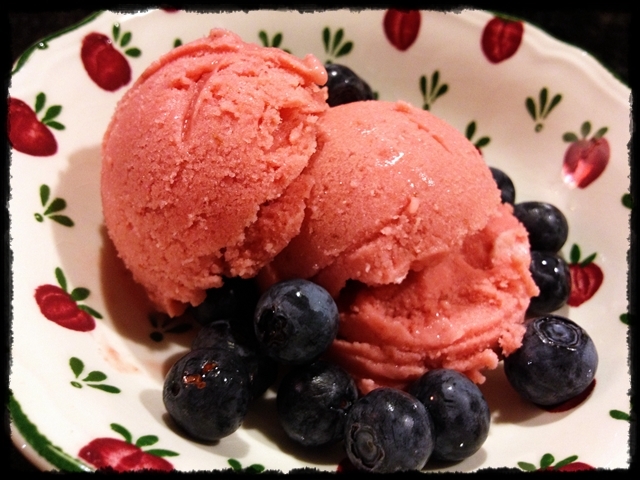 Sorbet has no dairy in it, sherbet contains up to 3% milk fat (from milk or cream). Pass the 3% level and you’ll get to ice cream territory. Feeling enlightened yet? 😉 I found this recipe in the latest issue of Bon Appetit, and the words “roasted strawberry” and “buttermilk” made me dream. The stars must be in a lucky alignment, because very little time elapsed between reading the recipe and getting to work. Fresh blueberries were a perfect match for this slightly tangy dessert. Heat oven to 425°. Combine strawberries and sugar in a 13 x 9 inches baking pan. Scrape in seeds from vanilla bean and add pod; toss to combine. Roast berries, stirring occasionally, until juices are bubbling, about 20 minutes. Let cool. Discard vanilla pod. Purée berries, buttermilk, sour cream, and salt in a blender until smooth. Place in the fridge for several hours or overnight. Process mixture in an ice cream maker according to manufacturer’s instructions. Transfer sherbet to an airtight container and freeze until ready to serve. Comments: My modifications of the recipe involved cutting down the sugar (the original called for 1 full cup) and reducing the buttermilk amount. The reduction in sugar had to do with our personal preference. The reduction in buttermilk had to do with the size of my blender. One cup filled it almost to the very top, a little more and we would have a buttermilk tsunami in the kitchen. I don’t think it made much difference, but check the link to the original recipe online in case you prefer to follow it. If you use the recipe I posted, please taste the mixture before you place it in the ice cream machine. You might prefer it a little sweeter than we do. For those who live in the US, have a wonderful 4th of July! ONE YEAR AGO: Amazing Ribs for the 4th of July! Beautiful pink colour and I love the combination of ingredients. Perfect for my ice cream maker. Glad you liked it! Happy 4th! I so need this for summer. Looking so freshlicious… Happy 4th of July, Sally! Miss you. It has been a while since I received your visit. That’s so cool that this is made with roasted strawberries – love that idea! And yes, every time I hear the word ‘buttermilk’ it causes and instant melting sensation in my body. Pavlov would have loved me ;-). I hope you have a wonderful July 4th celebration Sally — thinking of all of my American friends! enjoy it to the fullest along with a big bowl of this beautiful sherbet! (thank you, by the by, for the dairy/fat distinctions in this post too – enlightening indeed). I love the sour notes. And I want a bowl right now. 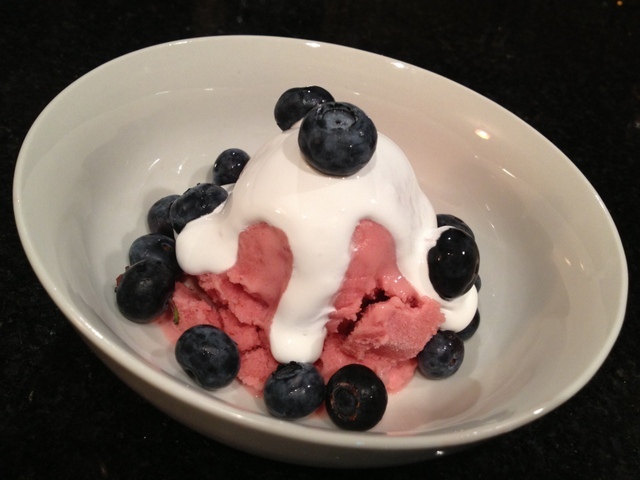 Love the red sherbet and blueberries! So perfect for today. I need to roast some strawberries. Sounds delicious. Hope you are having a wonderful 4th of July, Lisa…. I bookmarked this recipe in Bon Appetit also! ANd now I absolutely need to make it. Especially since I have a container of buttermilk in the fridge! The roasted strawberries must add so much flavor! I have never tried roasted strawberries and I know I am messing out!